Wasn’t it warm here yesterday. The temperature hit well above the 30°C mark, which is a vast difference from what it was just a few days ago. Today is supposed to be more of the same. It made sleeping last night an unpleasant experience. Our small house seems to heat up like the inside of a furnace by the end of the day. It didn’t cool off enough for me to fall fully asleep until 2am. I’m writing this at 6am (my usual time to wake up), after 4 hours of sleep. Thank goodness we bought that window fan. Not enough sleep, by a long shot. So forgive me if I don’t make much sense. It really didn’t help matters much that I had the stove on in the middle of the day. But I sort of had to for this recipe. Roasted vegetable aren’t quite the same un-roasted. Why on earth would I be making this in the height of summer? It wasn’t so much for me, but for my mother. I took her to town yesterday to have dental surgery so she is off solid food for several days ahead. But one still has to put food in their belly. Homemade soup is a great way to get much needed nutrients in a very delicious, easy way. And this recipe makes a lot. This soup is the cousin of traditional gazpacho. 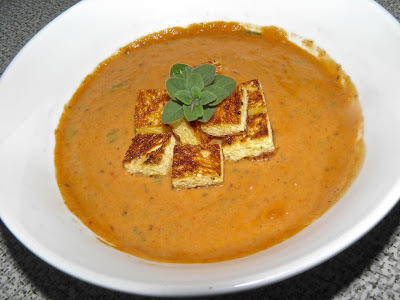 Gazpacho is a Spanish soup that is served chilled. It is a fresh vegetable, tomato-based, puréed soup commonly served in warm weather. I served mine at just above room temperature. My mother would probably not quite know what to think if it had been served completely cold. If you’re serving something simple – and cool – you need to introduce as much flavour as you possibly can. 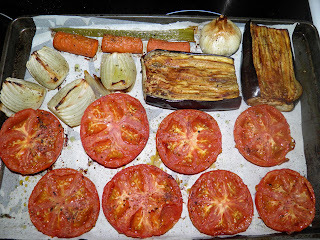 How I helped this along that path was by adding a lot of interesting ingredients to my roasting pan, like a whole head of garlic and an eggplant. The roasting added a smoky depth that fresh vegetables don’t have. Making this really couldn’t be easier. 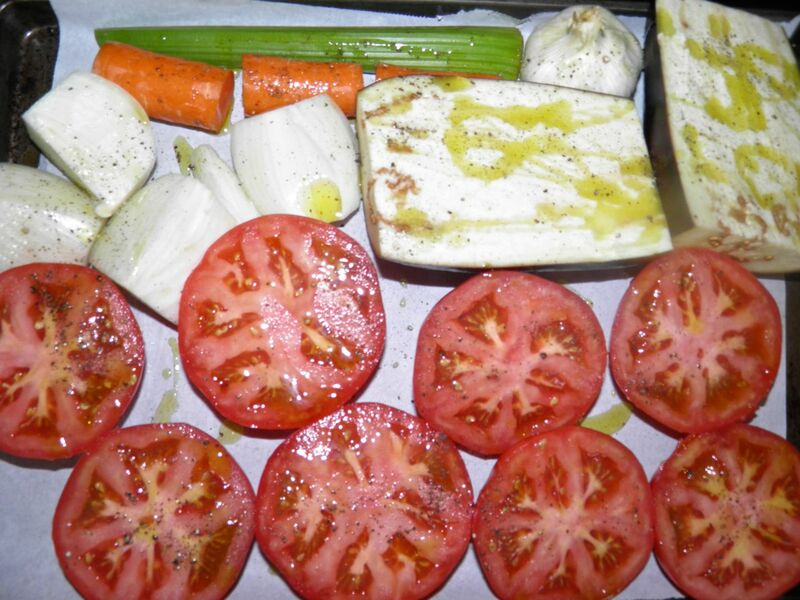 You cut up your vegetables, coat them well with olive oil, salt and pepper, and then stick them in the oven. Once cooled, a quick trip through the food processor reduces everything to a fine, orange “sludge.” (Not a very appetizing word...) Then simmer briefly to make sure everything is cooked through, chill (or not...) and serve. I also took the scissors and visited the herb garden to finish this off. A few sprigs of oregano and Italian parsley at the end added some bright highlights. You can serve this soup as thick or thin as you wish, so I really can’t give a definite yield. The amount of soup you make will also vary by the size of tomatoes, eggplant, etc. Yesterday I served it fairly thick because it was for a main course. But if you are having it for a first course at a dinner party you could thin it enough to serve 8 people easily. To “gild the lily” heat-wise I also turned on the stovetop and made croutons, not so much for mom as for me. They add a nice contrast to the puréed vegetables. That’s also a common accompaniment for gazpacho. I may very well soon find out how much like gazpacho this recipe is. I was only feeding two of us, so I have a large jar in the refrigerator. It is most certainly going to be warm here again today. It is 18° already. Whatever I make for dinner tonight will be cold. Cold, I tell you! Cold! After. Ready to be puréed. Line a baking sheet with parchment (to ease cleanup). Arrange the tomatoes, eggplant, onion, garlic, celery and carrot on the sheet. Drizzle with the olive oil and sprinkle with salt and pepper. Roast in the oven for 1 hour. Turn off the heat and let the vegetables cool down with the oven. Purée the vegetables in batches until very smooth. Pour into a stock pot. Thin the soup to your individual liking with evaporated milk, milk, light cream or even water. Add the oregano and parsley Simmer briefly, for about 5 minutes to bring all the flavours together. Taste for oregano, parsley, salt and pepper and adjust.